Brickell is the financial district of Miami Beach, Florida. Brickell is a fast-growing city, with new high-rise condominiums and corporate skyscrapers popping up everyday. The urban neighborhood surrounding Brickell Avenue is densely populated, consisting of high-rise residential neighborhood that features various upscale, luxury condo and apartment towers. Because of this, Brickell, Miami is considered to be the "Manhattan of the South." Brickell is the ideal mix for artists, musicians, and businessman alike. Street festivals and commissoned graffiti works decorate the Wynwood Community Arts District and is a popular nightlife destination. Mary Brickell Village is a trendy new shopping plaza that offers a wide array of shopping and dining options close to home. 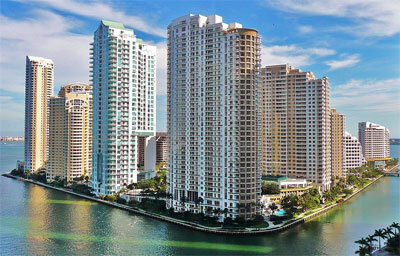 Looking for a good neighborhood to move to in Brickell? Renters should consider Camden Brickell, Nordica, One Broadway Brickell, Tuscany Gardens, and the Yacht Club at Brickell Apartments. Planning on buying your own home or condominium? Consider Axis on Brickell North, The Beacon at Brickell Village, Brickell 25, Neo Vertika, Brickell Bay Club, Conrad Miami, Espirito Santo Plaza, Jade Residence, or Bristol Tower. Schedule your Miami move now by booking with Moving On Up™. Miami-Dade residents will receive a FREE in-home visual estimate for a no-hassle binding-quote. Schedule your visual estimate now by requesting a moving quote or call 1-800-945-9569 now to speak to a live moving consultant to answer all your moving needs.